My friend Webb sent me this photo he came across the other day, taken by Robert Capa in 1939. This is a member of the Barcelona Philharmonic who fled Spain during the Spanish Civil War, The place is Bram, France. 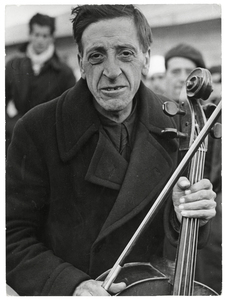 The caption of the photo from the news source reads "Former member of the Barcelona Philharmonic at an internment camp for Spanish refugees." It's an exceptionally powerful photograph. The eyes are vacant. He looks exhausted...hungry....lost. He clutches the one thing that probably gave him hope and comfort.....his cello. I don't know anything about this person, and no other details were provided. I did read that many such refugees were killed in these camps. A year after this, France fell to the Germans who instituted their own horrific treatment of refugees and lost souls who found themselves displaced or labeled as "undesirable." And what about his cello? What jumped out to me was that it is not in a case. He, and the others in this picture, are wearing heavy coats. Fine instruments don't do well in cold weather, exposed to the elements. Perhaps he was playing it when this picture was taken. What was he playing, I wonder? Perhaps a Bach Cello Suite? Given the events in our world today, this 76 year old picture seems like it could have been taken yesterday. If he was playing it at the time of the photo, I imagine the sweet, rich sounds only a cello can make gave him, and those around him, a brief sense of peace and comfort. To that end, let's listen to some beautiful cello music.